As a warehouse owner or manager, it’s your responsibility to protect employees from heavy equipment. The McCue Pedestrian Safety Barrier is designed to withstand impacts from forklifts and other warehouse vehicles, keeping your workers safe and your productivity high. Learn more and then request a quote. The McCue Pedestrian Barrier provides the ultimate protective shield between your employees and the hazards of the warehouse floor. It will take bumps from vehicles and push back. Clearly designate any pedestrian area or walkway while keeping out dangerous machinery. 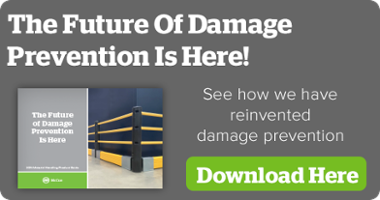 Combine the McCue Pedestrian Barrier and the Crash Barrier to provide your employees and warehouse assets with the protection they need. The Crash Barrier is made from solid steel and coated in durable polypropylene for strength and damage resistance. Use it to create traffic lanes and separate warehouse areas. McCue has been designing and manufacturing innovative asset protection products since 1988. We’re a leader in the damage prevention industry and provide our customers with total protection for every aspect of their business. Contact us to request a quote for our pedestrian safety barriers or any of our products.